On a mysterious errand for the Pathfinder Society, Count Varian Jeggare and his hellspawn bodyguard, Radovan, journey to the distant land of Tian Xia. When disaster forces him to take shelter in a warrior monastery, "Brother" Jeggare finds himself competing with the disciples of Dragon Temple as he unravels a royal mystery. 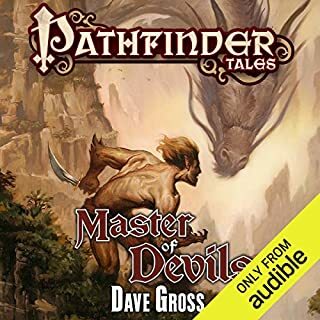 Meanwhile, Radovan - trapped in the body of a devil - must serve a twisted master by defeating the land's deadliest champions and learning the secret of slaying an immortal. Needs a Dramatic Organ playing. In the deep forests of Kyonin, elves live secretively among their own kind, far from the prying eyes of other races. Few of impure blood are allowed beyond the nation's borders, and thus it's a great honor for the half-elven Count Varian Jeggare and his hellspawn bodyguard, Radovan, to be allowed inside. Yet all is not well in the elven kingdom: Demons stir in its depths, and an intricate web of politics seems destined to catch the two travelers in its snares. The aristocratic Pathfinder Varian Jeggare and his hellspawn bodyguard, Radovan (Pathfinder's answer to Sherlock Holmes and Watson), return for their fifth standalone novel. When Varian is bequeathed a dangerous magical book by an old colleague, he and Radovan are pulled into a mystery that will set them on the path of a powerful necromancer seeking to become the new avatar of an ancient and sinister demigod - one of the legendary Runelords. But in saving the world, will Varian and Radovan lose their souls? After a century of imprisonment, demons have broken free of the wardstones surrounding the Worldwound. As fiends flood south into civilized lands, Count Varian Jeggare and his hellspawn bodyguard, Radovan, must search through the ruins of a fallen nation for the blasphemous text that opened the gate to the Abyss in the first place - and which might hold the key to closing it. In order to succeed, however, the heroes will need to join forces with pious crusaders, barbaric local warriors, and even one of the legendary god callers. With strength, wit, rakish charm, and a talking sword named Hrym, Rodrick has all the makings of a classic hero - except for the conscience. Instead, he and Hrym live a high life as scoundrels, pulling cons and parting the weak from their gold. When a mysterious woman invites them along on a quest into the frozen north in pursuit of a legendary artifact, it seems like a prime opportunity to make some easy coin - especially if there's a chance for a double-cross. In the foreboding north, the demonic hordes of the magic-twisted hellscape known as the Worldwound encroach upon the southern kingdoms of Golarion. Their latest escalation embroils a preternaturally handsome and coolly charismatic swindler named Gad, who decides to assemble a team of thieves, cutthroats, and con men to take the fight into the demon lands and strike directly at the fiendish leader responsible for the latest raids - the demon Yath, the Shimmering Putrescence. Rodrick is a con man, as charming as he is cunning. Hrym is a talking sword of magical ice, with the soul and spells of an ancient dragon. Together the two travel the world parting the gullible from their gold and freezing their enemies in their tracks. But when the two get summoned to the mysterious island of Jalmeray by a king with genies and elementals at his command, they'll need all their wits and charm if they're going to escape with the greatest prize of all - their lives. Gold, treachery, and magical talking swords! When murdered sinners fail to show up in hell, it's up to Salim Ghadafar, an atheist warrior forced to solve problems for the goddess of death, to track down the missing souls. In order to do so, Salim will need to descend into the anarchic city of Kaer Maga, following a trail that ranges from hell's iron cities to the gates of heaven itself. Along the way he'll be aided by a host of otherworldly creatures, a streetwise teenager, and two warriors of the mysterious Iridian Fold. After a century of imprisonment, demons have broken free of the wardstones surrounding the Worldwound. As fiends flood south into civilized lands, Count Varian Jeggare and his hellspawn bodyguard, Radovan, must search through the ruins of a fallen nation for the blasphemous text that opened the gate to the Abyss in the first place - and that might hold the key to closing it. The Hellknights are a brutal organization of warriors dedicated to maintaining law and order at any cost. For devil-blooded Jheraal, even the harshest methods are justified if it means building a better world for her daughter. Yet when a serial killer starts targeting hellspawn like Jheraal and her child, Jheraal has no choice but to use all her cunning and ruthlessness in order to defeat an ancient enemy to whom even death is no deterrent. Once a student of alchemy with the dark scholars of the Technic League, Alaeron fled their arcane order when his conscience got the better of him, taking with him a few strange devices of unknown function. Now in hiding in a distant city, he's happy to use his skills creating minor potions and wonders - at least until the back-alley rescue of an adventurer named Jaya lands him in trouble with a powerful crime lord. Raised as a wizard-priest in the church of the dark god Zon-Kuthon, Isiem escaped his sadistic masters and became a rebel, leaving behind everything he knew in order to follow his conscience. Now, his unique heritage makes him perfect for a dangerous mission into an ancient dungeon said to hold the magical Nightblade, a weapon capable of slaying devils by the thousands and freeing the world of their fiendish taint. For charming con man Rodrick and his talking sword, Hrym, life is all about taking what you can and getting away clean. But when the pair are arrested in the crusader nation of Lastwall, Rodrick faces immediate execution, with Hrym spending the rest of eternity trapped in an enchanted scabbard. Their only hope lies in a secret government program in which captured career criminals are teamed up and sent on suicide missions too sensitive for ordinary soldiers. When the leader of the ruthless Technic League calls in a favor, the mild-mannered alchemist Alaeron has no choice but to face a life he thought he'd left behind long ago. Accompanied by his only friend, a street-savvy thief named Skiver, Alaeron must head north into Numeria, a land where brilliant and evil arcanists rule over the local barbarian tribes with technology looted from a crashed spaceship. Excellent story in a fantasy setting I adore. For elven pathfinder Varian Jeggare and his devil-blooded assistant Radovan, things are rarely as they seem. Yet not even the notorious crime-solving duo is prepared for what they find when a search for a missing pathfinder takes them into the mist-shrouded mountains of gothic Ustalav. Beset on all sides by noble intrigue, mysterious locals, and the deadly creatures of the night, Varian and Radovan must use both sword and spell to track the strange rumors to their source and uncover a secret of unimaginable proportions. But it'll take more than merely solving the mystery to finish this job, for a shadowy figure has taken note of the pair's investigations, and is set on making sure neither man gets out of Ustalav alive. 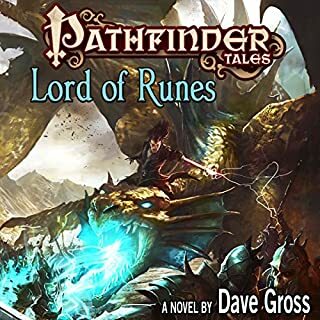 From fan-favorite author Dave Gross comes a new fantastical mystery set in the award-winning world of the Pathfinder Roleplaying Game. 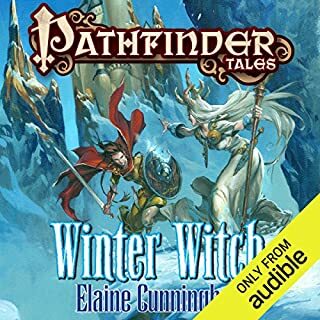 ©2010 Paizo Publishing, LLC (P)2015 Audible, Inc. I am a Pathfinders tabletop gamer and thoroughly enjoyed this book. one of the things I enjoyed about it is that someone who was not at all familiar with the Pathfinder system would enjoy the story as a story. 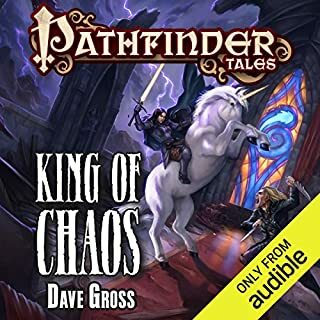 While at the same time a gamer like me sense Dave Gross' underlying understanding of the elements of the Pathfinder system and their inclusion in this Tale. the story was excellent, the mixture of intrigue, horror, and just enough love story made for a great story, read by an amazingly talented narrator. I've listened to this story a few times now and love it every time. This book is written very well, it feels weird at first but it becomes more natural the longer you listen. The story line is great and full of twists and turns, can't wait to listen to the next book. 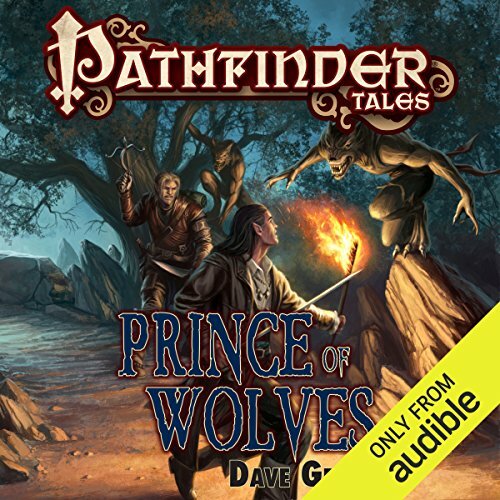 Where does Prince of Wolves rank among all the audiobooks you’ve listened to so far? What was one of the most memorable moments of Prince of Wolves? The atmosphere of the country they were in plus the tension caused by the separation of the two main characters really drove the story. Have you listened to any of Paul Boehmer’s other performances before? How does this one compare? This is the first of his books I have listened to but on the strength of it I picked up the second in this series. It was a solid well paced story, the two main characters have a good relationship that made me laugh a few times. Cant wait to finish the second book in this series! Vivid, involving mystery told in an interesting way. Stands alone as a great fantasy novel. They style of storytelling took a bit to get acquainted with, but now I love it! 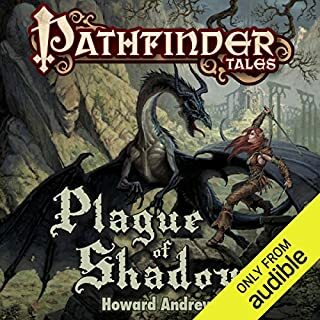 I'm avid Pathfinder player and expected to get some interesting world building and insight in the werewolves of Ustalav and the Harrow deck (including the mysterious, ominous Prince of Wolves card) but this book rambles on without any sense of urgency or necessity. The world building is tedious and flat. We never get more than a surface level insight into anyone or anything. There isn't a single woman character whose sexual attractiveness and/or sexual availability isn't immediately quantified by the main characters. There is an entire village of disabled people whom the main characters are openly disgusted by and pity. Overall, the writing is dull and shallow. It has NOT aged well since it was published in 2010. I will be avoiding all other Dave Gross books from now on. the two main characters of a fussy nobleman and his down to earth bodyguard are just so much fun to go through. its an engrossing story and the characters have lots of depth. I picked this book purely because I just started playing pathfinder recently, and I think I have exhausted the current available selection of 20+ hour fantasy books for a single credit. my experience with tie-in novels so far has been underwhelming. they tend to be kind of corny in my mind, and not terribly well written. this book is not that kind of tie-in novel. Gross's characters really feel alive, interesting, and fun. especially when Boehmer is narrating them (he is replaced later on, unfortunately). The story itself is mature without being over-the-top, and the mysteries are legitimately compelling. great book. i'd have enjoyed it even if i didn't know a thing about pathfinder. I love the Pathfinder books, and I've enjoyed following the adventures of Varian and Radovan. This book was a bit tough to follow for the first third of it - lots of characters and places to try to track - but it got quite good in the second half. I'm glad I read it overall. Well structured and interesting from mixed perspectives before coming together for the final chapters. Have you listened to any of Paul Boehmer’s other performances? How does this one compare? I've recently listened to the next book of the series and he is just as good. 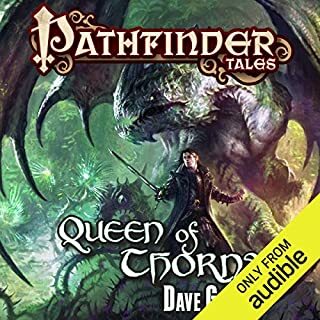 So far my favorite in the Pathfinder Tales series. Brings life and uniqueness to all the characters. The twist is really surprising and worked well into the story. Absolutely brilliant story loved every minute of listening to this, can't wait to read the next one! Took me a while to get into due to the style but it fleshed out nicely. The narrator really added to the story imo and I'll be looking for more by Paul Boehner.